Economics Essays: Economic Record of Gordon Brown. Economic Record of Gordon Brown. Since becoming Chancellor in 1997 Gordon Brown has presided over the longest period of economic expansion in the UK since records began. He is widely credited for having been a model of fiscal prudence which has allowed the UK to go from the laughing stock of Europe to one of the best performers in the OECD. Is Gordon Brown Britain’s best chancellor ever? Or is it more a case of being lucky to inherit a promising economic situation? Or is it as some people suggest an opportunity wasted, storing up economic problems for the future? This is a short economic evaluation of Gordon Browns’ record as Chancellor. Achievements of Gordon Brown as Chancellor of Exchequer. 1. Independence of Bank of England. 2. Longest Period of Economic Expansion on record. 3. Unemployment has fallen to the lowest level since the early 1970s. 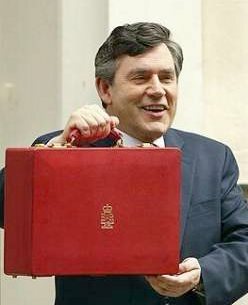 On coming to power Gordon Brown imposed a rule of fiscal prudence saying government borrowing should never exceed more than 3% of GDP over the course of the economic cycle. This justified some tough public spending decisions in the early years. However in recent times he has been close to breaking his own fiscal rule due to more extravagant spending on health and education. 5. Avoided potentially difficult economic situations. Although certain global factors have helped the UK economic performance Gordon Brown would point to potentially destabilizing influences which could have made things worse. For example; the dot com Boom and bust; the housing boom which threatened inflation; and the mild recession in Europe our main trading partner. None of these knocked the economy of target. Inflation has remained within the government’s target of CPI 2% +/-1. This is a remarkable record considering the recent inflation history of the UK. True much of the credit can be given to other sources. But unlike the previous Conservative governments, Gordon Brown never allowed himself to get carried away into thinking there had been an economic miracle. The Conservatives belief the economy could grow at 4%+ in the 1980s caused the boom and bust of the 1991. 7. Avoided Joining the EURO as the Eurozone went into recession. His 5 economic tests were designed to prevent premature entry. There seems little interest in reviving such as idea. The UK has not been burdened with an interest rate unsuitable for the UK economy. Between your two most recent posts, it is a nice summary of the best and the worst of Gordon Brown. However, the housing market will, in the long run, come back to destroy his legacy. He will be remembered as the finance minister responsible for a massive run-up in personal debt. for some of the details. i think it's time you revised this piece. gordon brown has been revealed as quite simply the worst chancellor the UK has ever had. Gordon Brown was the best chancellor we have ever seen in Britain, in the Labour Party. he will be remembered as the backbone of New Labour. Gordon Brown the 'Best Chancellor' (Finance Minister)? Not really. The UK's economic 'stability' was partly a sham built on easy credit and rising property prices. Blair and Brown inherited a stable economy and public finances from the previous Conservative administration of John Major. All those gains have all been 'p*ssed away' over subsequent years. Brown is an 'Economic Illiterate' and stubborn with it. His performance as Prime Minister after Blair, to say the least is 'mediocre', not the best. But then Brown is/was not 'Blair'. Blair is a 'con artist' (all alleged), a Second Hand car lot dealer, and charismatic with it. Brown is Brown, mediocre and not a good presenter in front of the Cameras. Like all previous Labor administrations, Brown will leave the UK's Public Finances in a mess, just like his predecessors of the late 1970s. History might be kinder to Brown than those who have lost out in the current recession of 2009. Brown and 'New Labor' will be seen as failed experiment in social engineering, economics and foreign policy (Iraq and Afghanistan). All Socialist orientated governments eventually run out of Other peoples money - Fact! !